On Friday May 15, from 6 to 8, City Councillor Adam Giambrone is the special guest at Friday Night Supper. The supper will be in an unusual location: at the playground. Adam will be available to take part in any and all conversations about upcoming playground changes. See the poster. For lots of background information about playgrounds, in Toronto and elsewhere, click here. 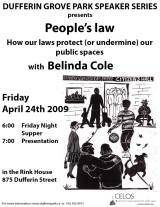 Belinda Cole has been studying the on-the-ground effects of laws on park campfires, picnics, farmers’ markets, shinny hockey players, playgrounds, and other public spaces for a long time. Can ordinary people get involved in making laws work for us, more often than every four years at election-time? Do the laws encourage us to speak, listen, and shape our surroundings? (They do in the Yukon – maybe we can learn from the Yukoners.) Belinda will show how easy it is to get “law literacy” and replace confusion with engaging conversations. The CEntre for LOcal research into Public Space began, very slowly, at Dufferin Grove, in 2000. CELOS is concerned about the well-being of the “public commons.” The April 17 session will lay out how the group works, who does the research and how, and how CELOS relates to the city government (i.e. very closely, sometimes too close for comfort). Jutta Mason will ask the question: how long can CELOS last and still be fun? Mike Sullivan, chair of the Weston Community Coalition, will be the speaker after this week's Friday Night Supper. He will tell what they have learned in in over five years of negotiation with three levels of government. The issue is the Georgetown rail corridor, which runs through this neighbourhood and many others. Will there be over 350 diesel trains a day within ten years? Read local e-list comments here. Speakers' Series: March 27, 6 to 8 pm. Friday Night Supper and "Nessie the Hydraulophone"
Dave Gildiner, who lives near the park, is part of a group that invented a new type of musical instrument that runs on water. It's called a "Nessie Hydraulophone." On Friday March 27, right after Friday Night Supper, "Nessie" will be setup in the rinkhouse for people to play. Dave's group wants to donate this instrument to the playground. Here's what they say about Nessie. March is the “brown month” in the park, also the mud month. But the rink clubhouse is dry and warm. The park cooks normally suspend the Friday Night Supper program in March and April, but this year they’re having too good of a time trying out new recipes. And there are important things to talk about (see below, and pages 5-6). Also, the economic slide is making cheap meals with neighbours at the park even more attractive than before. So the cooks are continuing with Friday night suppers. 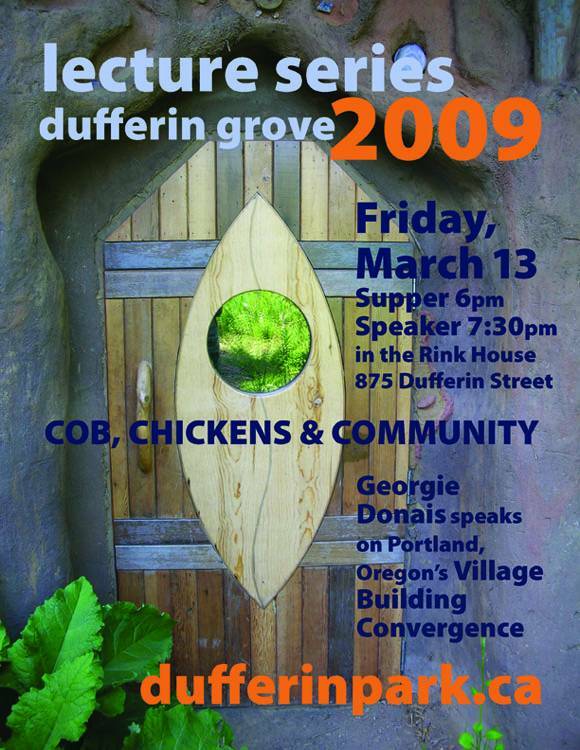 Georgie Donais brings her pictures and stories of Portland, Oregon’s annual gathering, the Village Building Convergence, showing how the city nurtures community innovation and connection between citizens. And backyard chickens. Michael Monastyrskyj has been following up local arrests in court for over a year. This is his first report back, telling real-life neighbourhood stories ranging from illegal wine sales, to arson, to gun arrests. Dave Gildiner is bringing this new instrument, developed at the University of Toronto, back to the park. It will be set up in the front room, close to a drain – it makes sounds with jets of water! Local musicians will be accompanying the other-wordly sound. Booked so far are: April 3, Mike Sullivan from the Weston Community Coalition, on the Georgetown Rail Corridor expansion; April 10 (Good Friday, no supper); April 17: Jutta Mason on Dufferin Grove Park as a community lab; April 24, Belinda Cole on the City of Toronto Act and how it affects local democracy. More topics TBA, suggestions welcome!